A well-executed food photo is a powerful thing these days — the photos are often the first things I look at, for better or worse, before going to a restaurant. 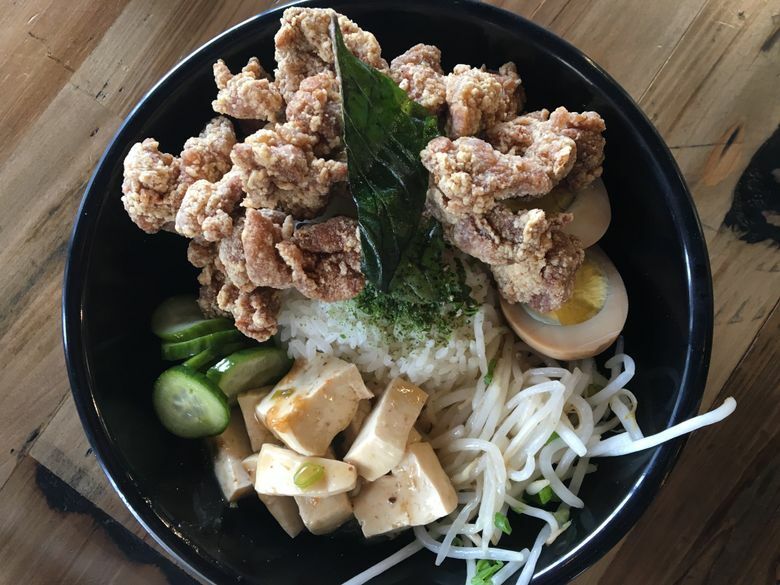 And they are what first drew me to Tiger Bites, a fast-casual Taiwanese fusion spot that opened recently on the Eastside; a few scrolls into its photogenic menu of open-mouthed baos and colorful rice bowls, my belly was grumbling. So I followed my instincts all the way to the restaurant. The idea behind the restaurant is, at least in part, rooted in nostalgia, too. Angela Cheng, one of Tiger Bites’ three owners, says their love for baos, a popular snack in Taiwanese night markets, and finding few bao options in the Seattle area inspired them to take matters into their own hands. And, rather than following tradition to a T, they wanted to add variety and their own flair to the local bao scene. The menu: Five savory baos lead the way, including the traditional pork-belly variety, kalbi beef and tofu. At $5.25 a pop, the baos land on the pricier end. A selection of rice bowls with similar proteins, plus several veggie sides and a soy-braised egg, offer a more cost-effective meal, at $10.50-$11.25 per bowl. Smaller plates include Tiger Fries (“Tiger Bites-style poutine,” as Cheng described it), which comprise French fries with kalbi beef, kimchi and onion, and topped with sweet and spicy mayo. It’s one of the restaurant’s signature dishes, and one of its most popular. Braised pork over rice is another small plate, and it’s one of Cheng’s personal favorites. 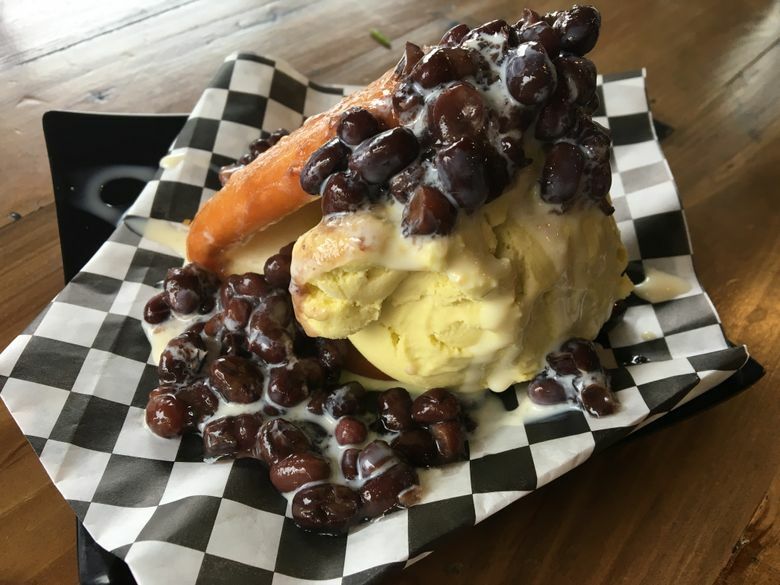 For dessert, deep-fried baos stuffed with ice cream and a selection of milk teas and other drinks could satisfy a sweet tooth. Teas are sourced from Taiwan, after a selective process that involved 13 tea-supplier taste tests, and the taro and red-bean drinks are made from fresh ingredients. They also make their own brown-sugar syrup for their teas, a less-sweet alternative to the fructose used in other tea shops, Cheng said. A note to the spicy-averse: For some dishes, the spice can be served on the side upon request. 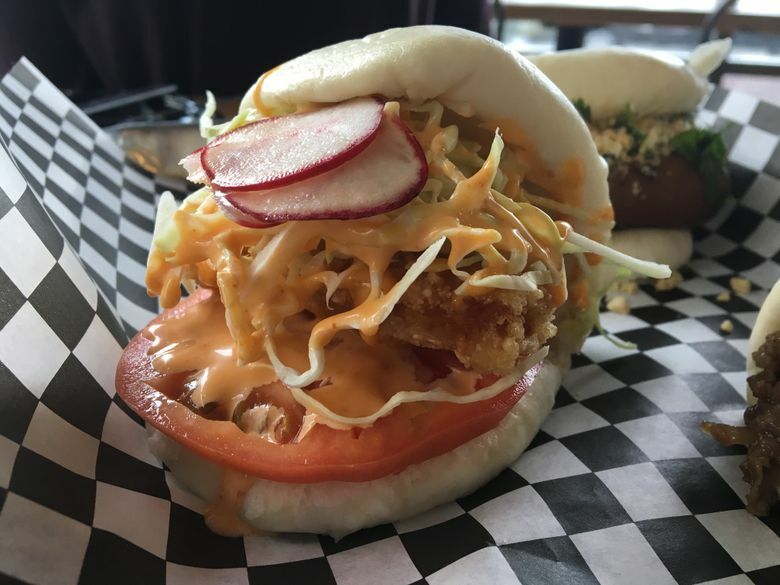 Don’t miss: The crispy cod bao — featuring deep-fried Pacific cod, tomato, shredded cabbage, pickled radish and spicy mayo — was quite good. The spicy mayo was, as advertised, mild (I have a two-star tolerance when it comes to spice) and complemented the cod nicely. Prices: The pork-belly bao, crispy cod bao, kalbi beef bao ($14 for three), five-spice popcorn-chicken rice bowl ($10.50), crispy string beans ($4.95) and matcha bao ($5) amounted to $34.45 before tax and tip, and fed three. Taiwanese fusion; 14701 N.E. 20th St., Suite M12, Bellevue; 425-200-4016, tiger-bites.com; Sunday-Thursday 11 a.m.-9 p.m., Friday-Saturday 11 a.m.-10 p.m.